Nandi Hills MP Alfred Keter and two others have been released on a Ksh5 million bond or a cash bail of Sh 2 million each and directed to report to the Directorate of Criminal Investigations (DCI) once every week. Keter and Desai Limited Directors Madat Saburali Chatur and Johnstone Arthur Sakwa were charged with conspiracy to defraud Central Bank of Kenya over Ksh600 million through forged Treasury Bills. The three also face other charges including forgery and presenting false documents. They are alleged to have committed the offences on February 16 2018 at the CBK headquarters in Nairobi County. 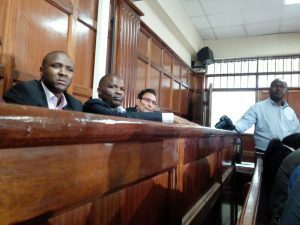 State counsels Daniel Karuri and Solomon Naulikha objected to the release of Madat Saburali Chatur on bond saying that his identity was yet to be confirmed and may jump bail, a request the suspect’s lawyer objected to stating that his identity had not been an issue in the case. Chatur was however granted bond with the court ruling that the prosecution did not state any compelling reasons to warrant denial of bond. Chief magistrate Francis Andayi directed the prosecution to provide the defense lawyers with CBK’s CCTV footage and all the documentary evidence they would rely on. The court also asked Alfred Keter to request Safaricom to provide phone data of conversations between the MP and the CBK Governor Patrick Njoroge. The case will be mentioned on March 5 2018 with hearing set for June 4 and 12 2018. Some really wonderful work on behalf of the owner of this website , perfectly outstanding content material. My wife and i ended up being quite peaceful Raymond could carry out his homework through the entire precious recommendations he came across from your very own site. It's not at all simplistic to just continually be releasing points which often people have been making money from. And we see we need the blog owner to give thanks to for this. The specific illustrations you have made, the straightforward web site navigation, the friendships your site help create - it's most unbelievable, and it is helping our son and our family reason why that topic is thrilling, and that's tremendously vital. Thank you for all the pieces! I appreciate your article. The article is wonderful and humane. Nearly all of what you assert happens to be astonishingly precise and that makes me wonder why I had not looked at this with this light before. This article really did switch the light on for me as far as this subject matter goes. Nevertheless at this time there is just one issue I am not too comfortable with so while I make an effort to reconcile that with the actual main theme of your point, allow me observe just what all the rest of the readers have to point out.Very well done. Excellent web site. Plenty of helpful information here. I am sending it to a few pals ans additionally sharing in delicious. And certainly, thanks on your sweat! Good day I am so thrilled I found your web site, I really found you by error, while I was looking on Digg for something else, Nonetheless I am here now and would just like to say many thanks for a fantastic post and a all round exciting blog (I also love the theme/design), I don’t have time to go through it all at the minute but I have bookmarked it and also added in your RSS feeds, so when I have time I will be back to read a great deal more, Please do keep up the superb work. Excellent site. Plenty of helpful info here. I’m sending it to some friends ans also sharing in delicious. And obviously, thank you on your effort! Some truly terrific work on behalf of the owner of this internet site, utterly outstanding subject material. Rattling informative and excellent bodily structure of content material, now that's user pleasant (:. I’m impressed, I must say. Really hardly ever do I encounter a blog that’s both educative and entertaining, and let me let you know, you've got hit the nail on the head. Your idea is outstanding; the issue is one thing that not sufficient individuals are speaking intelligently about. I'm very completely satisfied that I stumbled across this in my search for something relating to this. The very crux of your writing whilst sounding reasonable at first, did not sit properly with me after some time. Someplace within the paragraphs you were able to make me a believer unfortunately only for a while. I however have got a problem with your leaps in logic and one would do nicely to help fill in all those breaks. When you actually can accomplish that, I would undoubtedly be amazed. I would like to thnkx for the efforts you've put in writing this blog. I am hoping the same high-grade website post from you in the upcoming also. In fact your creative writing skills has inspired me to get my own web site now. Actually the blogging is spreading its wings fast. Your write up is a great example of it. I conceive this website contains some really good info for everyone :D. "Do not go where the path may lead, go instead where there is no path and leave a trail." by Ralph Waldo Emerson. Very well written story. It will be helpful to anyone who employess it, as well as me. Keep doing what you are doing - for sure i will check out more posts. It is really a great and useful piece of information. I am happy that you just shared this helpful info with us. Please keep us informed like this. Thank you for sharing. Wow! This could be one particular of the most helpful blogs We've ever arrive across on this subject. Basically Magnificent. I'm also an expert in this topic therefore I can understand your hard work. It's appropriate time to make some plans for the long run and it's time to be happy. I've read this post and if I may just I want to recommend you few attention-grabbing things or suggestions. Perhaps you could write subsequent articles referring to this article. I wish to learn even more things approximately it! Great web site. Lots of helpful info here. I am sending it to several friends ans additionally sharing in delicious. And certainly, thank you to your effort! A powerful share, I just given this onto a colleague who was doing a bit evaluation on this. And he in actual fact bought me breakfast as a result of I discovered it for him.. smile. So let me reword that: Thnx for the deal with! However yeah Thnkx for spending the time to debate this, I feel strongly about it and love reading more on this topic. If potential, as you become experience, would you thoughts updating your blog with more details? It is highly helpful for me. Huge thumb up for this weblog submit! I used to be more than happy to find this net-site.I needed to thanks to your time for this wonderful learn!! I definitely having fun with each little little bit of it and I have you bookmarked to take a look at new stuff you weblog post. I genuinely enjoy studying on this web site, it has got excellent posts. "One doesn't discover new lands without consenting to lose sight of the shore for a very long time." by Andre Gide. Hey! Someone in my Myspace group shared this website with us so I came to take a look. I'm definitely loving the information. I'm book-marking and will be tweeting this to my followers! Wonderful blog and terrific design and style. What i do not understood is in fact how you are no longer actually a lot more well-favored than you may be right now. You are very intelligent. You realize therefore significantly in the case of this topic, made me individually imagine it from a lot of numerous angles. Its like women and men aren't fascinated unless it is something to do with Girl gaga! Your own stuffs excellent. Always deal with it up! Pretty nice post. I just stumbled upon your weblog and wanted to mention that I've really enjoyed browsing your blog posts. After all I will be subscribing in your feed and I am hoping you write once more very soon! I likewise believe therefore, perfectly written post! . Hello there, I found your web site via Google while looking for a related topic, your web site came up, it looks great. I've bookmarked it in my google bookmarks. I?¦m no longer certain where you are getting your information, however great topic. I must spend a while studying more or working out more. Thanks for great information I used to be on the lookout for this info for my mission. Youre so cool! I dont suppose Ive read anything like this before. So good to search out anyone with some unique thoughts on this subject. realy thank you for starting this up. this website is one thing that is wanted on the web, somebody with a bit originality. helpful job for bringing one thing new to the web! Hey there, You have done a fantastic job. I will certainly digg it and for my part recommend to my friends. I'm confident they will be benefited from this site. It's a shame you don't have a donate button! I'd certainly donate to this brilliant blog! I suppose for now i'll settle for book-marking and adding your RSS feed to my Google account. I look forward to new updates and will share this website with my Facebook group. Chat soon! Only a smiling visitor here to share the love (:, btw outstanding design. "Competition is a painful thing, but it produces great results." by Jerry Flint. I am glad to be a visitor of this unadulterated site! , appreciate it for this rare info ! . This website is really a walk-through for the entire info you wished about this and didn’t know who to ask. Glimpse right here, and also you’ll definitely uncover it. Great write-up, I¦m normal visitor of one¦s website, maintain up the excellent operate, and It's going to be a regular visitor for a long time. Good post. I study something tougher on totally different blogs everyday. It would at all times be stimulating to read content from different writers and follow a bit of something from their store. I’d choose to use some with the content material on my blog whether you don’t mind. Natually I’ll give you a link in your internet blog. Thanks for sharing. Thank you for any other informative site. Where else may I get that kind of information written in such a perfect approach? I've a mission that I'm simply now operating on, and I've been at the glance out for such info. Good write-up, I’m normal visitor of one’s website, maintain up the excellent operate, and It's going to be a regular visitor for a lengthy time. Excellent site. A lot of helpful info here. I am sending it to some pals ans also sharing in delicious. And of course, thank you for your sweat! Always a large fan of linking to bloggers that I like but dont get quite a bit of link adore from. Appreciating the persistence you put into your blog and in depth information you offer. It's great to come across a blog every once in a while that isn't the same unwanted rehashed material. Wonderful read! I've saved your site and I'm including your RSS feeds to my Google account. I enjoy you because of every one of your efforts on this site. Debby loves carrying out investigation and it's obvious why. Almost all notice all about the compelling method you give priceless thoughts by means of this web blog and attract contribution from the others on this idea then our own daughter is always starting to learn a great deal. Have fun with the remaining portion of the new year. Your performing a pretty cool job. I have been checking out a few of your articles and it's pretty clever stuff. I will surely bookmark your blog. Wow, wonderful weblog layout! How lengthy have you been blogging for? you made running a blog glance easy. The entire glance of your web site is great, let alone the content! You completed a number of good points there. I did a search on the theme and found most people will have the same opinion with your blog. My spouse and I stumbled over here different page and thought I might as well check things out. I like what I see so now i am following you. Look forward to exploring your web page for a second time. Hi there very cool web site!! Guy .. Beautiful .. Amazing .. I'll bookmark your blog and take the feeds additionallyKI'm glad to search out numerous useful information right here within the submit, we'd like develop extra strategies in this regard, thanks for sharing. . . . . .
Hello very nice site!! Man .. Excellent .. Wonderful .. I'll bookmark your web site and take the feeds additionallyKI'm happy to seek out so many helpful information here in the publish, we need work out extra strategies in this regard, thanks for sharing. . . . . .
My partner and I absolutely love your blog and find the majority of your post's to be what precisely I'm looking for. can you offer guest writers to write content for you? I wouldn't mind creating a post or elaborating on a number of the subjects you write in relation to here. Again, awesome blog! I've been browsing on-line greater than 3 hours these days, yet I never discovered any attention-grabbing article like yours. It¦s pretty value sufficient for me. Personally, if all website owners and bloggers made excellent content material as you probably did, the web can be much more useful than ever before. Thanks for one's marvelous posting! I genuinely enjoyed reading it, you are a great author.I will ensure that I bookmark your blog and will eventually come back later in life. I want to encourage you to ultimately continue your great work, have a nice holiday weekend! hello!,I love your writing so much! percentage we communicate more about your article on AOL? I require an expert in this house to solve my problem. Maybe that is you! Having a look ahead to see you. Thank you for the auspicious writeup. It if truth be told was a enjoyment account it. Look complex to far brought agreeable from you! By the way, how could we keep up a correspondence? Perfectly written content, thankyou for entropy. I was reading some of your blog posts on this site and I believe this web site is real instructive! Keep putting up. Hey! Someone in my Facebook group shared this site with us so I came to give it a look. I'm definitely enjoying the information. I'm book-marking and will be tweeting this to my followers! Superb blog and terrific style and design. What¦s Going down i'm new to this, I stumbled upon this I have found It absolutely helpful and it has helped me out loads. I'm hoping to contribute & aid other users like its helped me. Good job. I?¦m now not sure the place you are getting your information, however good topic. I needs to spend a while studying much more or figuring out more. Thank you for wonderful information I used to be in search of this information for my mission. Hello there, I discovered your site by means of Google while looking for a related matter, your website came up, it seems good. I've bookmarked it in my google bookmarks. Thank you for every one of your efforts on this blog. Kate take interest in conducting investigation and it's simple to grasp why. My partner and i learn all about the compelling method you convey worthwhile tactics on the website and in addition increase contribution from other individuals on the topic so our own princess is really learning so much. Have fun with the rest of the new year. You're the one performing a stunning job. I have been surfing on-line more than three hours lately, but I never discovered any fascinating article like yours. It is lovely price enough for me. Personally, if all web owners and bloggers made good content as you did, the internet will likely be much more useful than ever before. hi!,I love your writing so a lot! share we communicate more about your post on AOL? I require an expert on this area to unravel my problem. May be that's you! Having a look forward to look you. I really enjoy reading through on this website, it holds fantastic blog posts. "And all the winds go sighing, For sweet things dying." by Christina Georgina Rossetti. Hi there very nice website!! Guy .. Beautiful .. Superb .. I will bookmark your website and take the feeds additionally…I am happy to search out a lot of helpful information here within the publish, we need work out extra strategies on this regard, thank you for sharing. . . . . .
Hi there, I found your site via Google while searching for a related topic, your site came up, it looks great. I've bookmarked it in my google bookmarks. I wish to express thanks to the writer for bailing me out of such a matter. After checking through the the net and obtaining tricks which are not pleasant, I assumed my entire life was well over. Living minus the answers to the issues you have solved by means of your posting is a serious case, as well as the kind that could have badly affected my career if I had not noticed the website. Your personal natural talent and kindness in controlling all areas was very helpful. I'm not sure what I would've done if I had not come upon such a subject like this. It's possible to at this moment look ahead to my future. Thanks a lot so much for the skilled and results-oriented guide. I won't hesitate to propose your web sites to anybody who would like support on this subject matter. hi!,I like your writing very much! share we communicate more about your post on AOL? I need a specialist on this area to solve my problem. Maybe that's you! Looking forward to see you. After examine a couple of of the weblog posts in your website now, and I really like your way of blogging. I bookmarked it to my bookmark website list and will probably be checking again soon. Pls take a look at my website as well and let me know what you think. I believe this site has some real wonderful info for everyone. "A sense of share is not a bad moral compass." by Colin. Outstanding post, I believe blog owners should learn a lot from this weblog its rattling user friendly. obviously like your web site however you need to take a look at the spelling on several of your posts. Several of them are rife with spelling issues and I find it very troublesome to inform the truth on the other hand I will definitely come again again. With havin so much content and articles do you ever run into any issues of plagorism or copyright infringement? My website has a lot of unique content I've either created myself or outsourced but it appears a lot of it is popping it up all over the internet without my agreement. Do you know any solutions to help stop content from being stolen? I'd certainly appreciate it. Thanks , I've recently been searching for info about this topic for a long time and yours is the best I've found out so far. But, what in regards to the conclusion? Are you sure concerning the supply? Nice post. I was checking constantly this blog and I am impressed! Extremely helpful information specially the final phase :) I maintain such information much. I used to be looking for this certain info for a long time. Thank you and good luck. I’ve been exploring for a bit for any high-quality articles or weblog posts on this sort of area . Exploring in Yahoo I eventually stumbled upon this website. Reading this information So i’m satisfied to show that I've an incredibly good uncanny feeling I discovered just what I needed. I so much definitely will make certain to do not put out of your mind this web site and give it a look regularly. certainly like your web-site but you have to test the spelling on quite a few of your posts. Several of them are rife with spelling problems and I to find it very troublesome to tell the truth nevertheless I will surely come back again. Throughout the great design of things you receive an A for hard work. Where you lost me personally ended up being in your particulars. You know, they say, the devil is in the details... And it could not be more correct at this point. Having said that, let me reveal to you just what exactly did give good results. Your text is certainly rather convincing and this is possibly the reason why I am taking the effort in order to opine. I do not make it a regular habit of doing that. Next, even though I can notice a leaps in reason you come up with, I am not certain of exactly how you seem to connect the points which inturn make the final result. For the moment I will, no doubt subscribe to your position but trust in the foreseeable future you actually connect the dots much better. I got what you intend, regards for posting.Woh I am pleased to find this website through google. "The test and use of a man's education is that he finds pleasure in the exercise of his mind." by Carl Barzun. I have read some excellent stuff here. Certainly price bookmarking for revisiting. I surprise how much effort you set to make any such magnificent informative website. It?¦s in reality a nice and helpful piece of information. I?¦m satisfied that you shared this useful info with us. Please stay us informed like this. Thank you for sharing. Nice post. I was checking continuously this blog and I'm impressed! Very helpful info particularly the last part :) I care for such information a lot. I was looking for this particular information for a long time. Thank you and good luck. I think this web site contains some rattling good info for everyone : D.
Spot on with this write-up, I actually assume this web site needs way more consideration. I’ll most likely be once more to read far more, thanks for that info. My coder is trying to convince me to move to .net from PHP. I have always disliked the idea because of the expenses. But he's tryiong none the less. I've been using WordPress on several websites for about a year and am worried about switching to another platform. I have heard great things about blogengine.net. Is there a way I can import all my wordpress content into it? Any help would be really appreciated! Hi there, You've performed a great job. I will certainly digg it and in my view suggest to my friends. I'm sure they will be benefited from this web site. I?¦ve read several excellent stuff here. Certainly price bookmarking for revisiting. I wonder how so much effort you set to create one of these wonderful informative site. Perfectly indited content material, thankyou for entropy. hi!,I like your writing very much! share we be in contact extra approximately your article on AOL? I require an expert in this area to resolve my problem. Maybe that's you! Taking a look forward to see you. Hi, Neat post. There is an issue with your site in web explorer, may check thisK IE nonetheless is the marketplace leader and a large section of other folks will miss your fantastic writing because of this problem. F*ckin’ tremendous issues here. I’m very glad to look your post. Thank you a lot and i am taking a look ahead to touch you. Will you please drop me a e-mail? Good day! I just wish to give an enormous thumbs up for the good information you have got right here on this post. I will probably be coming again to your weblog for extra soon. A powerful share, I simply given this onto a colleague who was doing somewhat evaluation on this. And he in actual fact purchased me breakfast as a result of I discovered it for him.. smile. So let me reword that: Thnx for the treat! However yeah Thnkx for spending the time to debate this, I really feel strongly about it and love studying extra on this topic. If doable, as you become experience, would you mind updating your blog with more details? It is extremely helpful for me. Big thumb up for this weblog post! I just could not go away your website prior to suggesting that I really enjoyed the usual information a person provide in your guests? Is going to be again regularly to check up on new posts. Some truly nice and utilitarian information on this web site, too I think the layout contains superb features. A lot of the things you articulate happens to be astonishingly precise and that makes me wonder why I hadn't looked at this with this light previously. This piece really did turn the light on for me personally as far as this topic goes. Nonetheless at this time there is one particular issue I am not too comfortable with so while I make an effort to reconcile that with the central theme of the position, permit me observe what all the rest of the readers have to point out.Nicely done. I have been browsing online more than 3 hours nowadays, yet I by no means discovered any fascinating article like yours. It is lovely worth sufficient for me. In my view, if all web owners and bloggers made just right content material as you probably did, the web will be a lot more useful than ever before. "Revolution is not a onetime event." by Audre Lorde. You really make it appear really easy together with your presentation but I in finding this matter to be really something that I believe I would by no means understand. It kind of feels too complicated and very large for me. I'm looking forward for your next submit, I¦ll try to get the hold of it! Thanks for some other informative web site. Where else may I get that type of information written in such an ideal manner? I've a challenge that I'm simply now working on, and I've been on the glance out for such information. The next time I learn a weblog, I hope that it doesnt disappoint me as a lot as this one. I mean, I know it was my choice to learn, but I actually thought youd have one thing attention-grabbing to say. All I hear is a bunch of whining about something that you can fix if you happen to werent too busy searching for attention. I will right away clutch your rss as I can not find your email subscription link or newsletter service. Do you've any? Kindly allow me recognise so that I may just subscribe. Thanks. Hiya, I'm really glad I have found this information. Nowadays bloggers publish only about gossips and internet and this is really frustrating. A good web site with interesting content, that is what I need. Thanks for keeping this site, I'll be visiting it. Do you do newsletters? Can not find it. Woah! I'm really loving the template/theme of this site. It's simple, yet effective. A lot of times it's difficult to get that "perfect balance" between superb usability and appearance. I must say you've done a awesome job with this. Also, the blog loads super quick for me on Chrome. Superb Blog! Hello there, simply become alert to your blog through Google, and located that it is really informative. I’m going to be careful for brussels. I will be grateful when you proceed this in future. Lots of folks can be benefited out of your writing. Cheers! I got what you mean , thankyou for putting up.Woh I am pleased to find this website through google. "Wisdom doesn't necessarily come with age. Sometimes age just shows up by itself." by Woodrow Wilson. Real great visual appeal on this internet site, I'd rate it 10 10. Do you mind if I quote a couple of your posts as long as I provide credit and sources back to your weblog? My blog is in the very same niche as yours and my users would genuinely benefit from some of the information you present here. Please let me know if this alright with you. Cheers! Simply desire to say your article is as amazing. The clarity for your post is simply spectacular and i can assume you're a professional in this subject. Well along with your permission allow me to take hold of your feed to stay updated with forthcoming post. Thank you 1,000,000 and please continue the gratifying work. It is actually a great and helpful piece of info. I’m satisfied that you simply shared this useful information with us. Please stay us up to date like this. Thanks for sharing. Howdy very cool web site!! Guy .. Beautiful .. Wonderful .. I'll bookmark your site and take the feeds also…I'm glad to find so many useful information right here in the put up, we'd like develop more techniques in this regard, thanks for sharing. . . . . .
Hiya very nice blog!! Guy .. Beautiful .. Superb .. I will bookmark your site and take the feeds additionally…I'm satisfied to seek out so many useful info right here within the post, we'd like work out extra techniques on this regard, thanks for sharing. . . . . .
you are really a good webmaster. The website loading speed is incredible. It seems that you are doing any unique trick. Furthermore, The contents are masterpiece. you have done a great job on this topic! Great post. I used to be checking constantly this weblog and I am impressed! Very useful info particularly the final part :) I deal with such information a lot. I used to be seeking this particular info for a long time. Thank you and good luck. k91oyN You have brought up a very good details , appreciate it for the post.